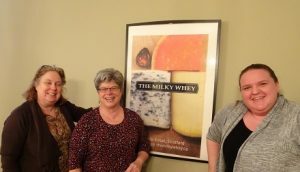 Liz Payne, proprietor of The Milky Whey Fine Cheese Shop, in Stratford, Ontario, is in her 10th year as a cheese monger and self-described “käsephile” or lover of cheese. 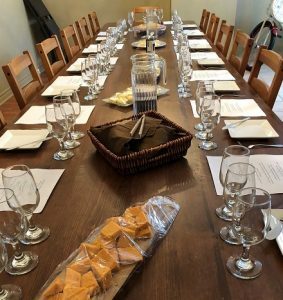 We attended Dark Beer and Stinky Cheese Pairing, the fourth in her series of nine pairing events running from October, 2018, to April, 2019. Stinky cheese becomes stinky because of the bacteria that is smeared on the outside of the cheese as it ages. There is a cheese in France, that is so smelly it is banned from being carried on public transportation. Limberger, a German cheese, is often described, at certain stages of ripeness, as smelling like dirty socks. In fact, this is possible because the bacteria used in the Limberger process matches the bacteria responsible for human body odour. 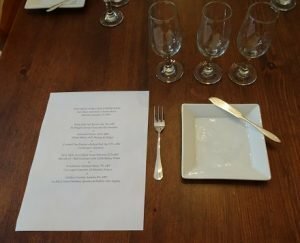 The cheese experience in our group of tasters varied. Some had never tasted a stinky cheese before. Some declared there wasn’t a cheese they didn’t like. All of us considered ourselves cheese lovers. This brown ale with a light bitterness paired perfectly with the rich organic cheese made from local Brussels, Ontario, milk. This cheese would melt nicely in a grilled cheese sandwich. It is named for St. Brigid of Ireland who is said to be the patron saint of dairy maids, butter, and cheese. The dark porter not only cleansed our palates it matched well with the white stilton. Infused with mango and crystallized ginger, the cheese brought cheesecake to mind. It would be ideal on a dessert tray. A sweet compliment to the bitter but sweet Guinness. Cowbell Doc Perdue’s Bobcat Red Ale 5.5% ABV with Limburger from Germany. This red ale is hoppy and dry. Some of us detected a hint of grapefruit or citrus. The cheese is a story on its own. Limburger has a reputation for being really stinky. This particular Limberger was not terribly foul-smelling. In fact, the pleasure of the texture and flavor far outshone any scent. The Bobcat Red Ale helped, too. Surprisingly, this Limberger cheese was voted a favourite by the majority of the cheese tasters in our group. Holy Molé from Black Swan Brewery 4.7% ABV with Red Devil – Red Leicester with Chilli Flakes, from Wales. 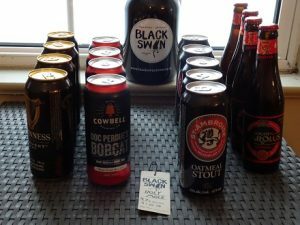 The Holy Molé is a part of the Black Swan Brewery’s Playground series of brews influenced by ingredients foraged in Perth County. It is smooth. The Red Devil cheese, a brilliant red-orange colour with creamy texture, melts in the mouth then bites back in the throat. This pairing would make a good beer cheese soup. St. Ambroise Oatmeal Stout 5% ABV with Cave-aged Gruyere, 24 months, from Switzerland. The dark colour and chocolate and espresso undertones of this stout meet their flavor match with this densely textured, strongly flavoured gruyere. By maturing in sandstone caves this gruyere is slightly aromatic, soft but firm. Gouden Carolus Ambrio 8% ABV with Le Silo 6 Year Cheddar from Quebec and a Rabbit with Apples coarsely textured paté. This Belgian, amber-gold, full-flavoured, malty ale dates back to 1421. 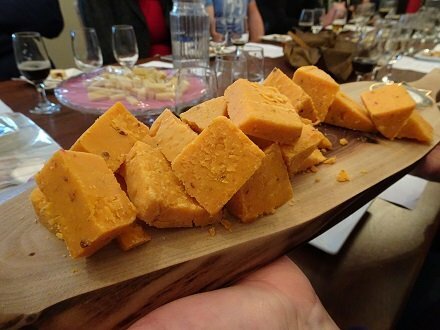 The aged cheddar offered up a crunch, known in Italian as grana. Flaky, crunchy, textured cheeses like this one are primarily used for grating. 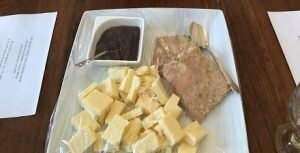 The ale, often served with ham and mustards, worked well with the rabbit and apple paté. A red currant jelly provided a contrast to the richness. For storing cheese, double wrap it with a parchment-type paper and then set it into a Ziploc-type storage bag or plastic airtight container. Allowing cheese to sit out on the counter leads to disaster. Blue and white mold is okay. Red and black mold is not, throw it out. In the winter, hold off on purchasing soft cheeses in grocery stores in January. They tend to be sitting a while. 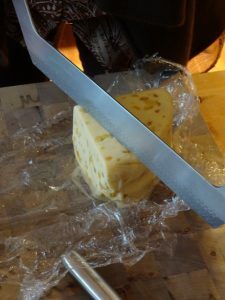 After purchase, hard cheeses last longer. Soft cheeses should be eaten sooner. 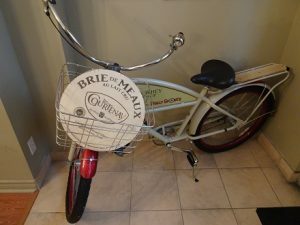 The upcoming pairing events at The Milky Whey are The Best Cheeses to Pair with White Wines, February 16, 2019; The Best Cheeses to Pair with Red Wines, February 23, 2019, and French Cheese and Wine Pairing, March 23, 2019.